DKT offers a legacy suite of 19″ laser transmitters, both DFB and externally modulated models for long distances. DKT model LT1550 employs a high performance thermally stabilized, DFB, low-chirp, isolated laser to transmit CATV signals. Operating on a specific optical wavelength in the ITU-DWDM grid, the unit suits single mode optical fiber networks with or without dense wavelength division multiplexing (DWDM). DKT model LTE153-6000 series of transmitters are high performance, 1550nm externally modulated transmitters optimized for single EDFA fiber links in the 80 to 100 kilometer range. The model takes advantage of the LTE153-6000 series advanced fiber dispersion compensation circuitry to provide exceptional CATV performance. The HEMT series of transmitters provide a cost efficient, transport solution for medium to long distances. 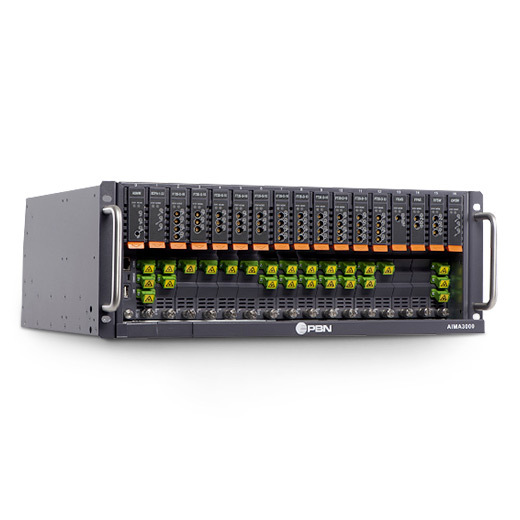 The design employs a 19” rack of 4RU height, with 17 slots (0~16) for high-density application modules and integrated front and rear fiber-access panel for easy fiber management. Slot 0 is used for a System Management Module (ASMM). Slots 1~16 can be used for any of the application modules. This provides capability for a maximum of 32 standard forward-path laser transmitters, or for 64 QAM laser transmitters, or for 64 return-path receivers. DKT’s Erbium-Doped Fiber Amplifier (EDFA) is ideally suitable for CATV applications with high output power and low noise figure.